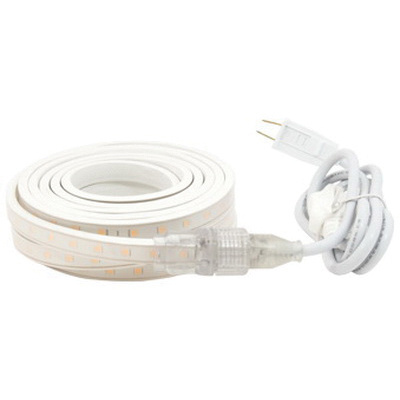 American Lighting Hybrid-2 LED Tape rope kit utilizes 5050 SMD LEDs that emit up to 145 Lumens/ft, with an easy to work run lengths up to 150 ft. This 18-Watt tape rope has a color temperature of 2700K and CRI of 82+ for superior color rendering. The lamp has an average life up to 30000 hours. It has flexible rubber housing with clear PVC lens, which are protected with UV inhibitor. The LED tape rope provides 120-degree beam angle for even light distribution. 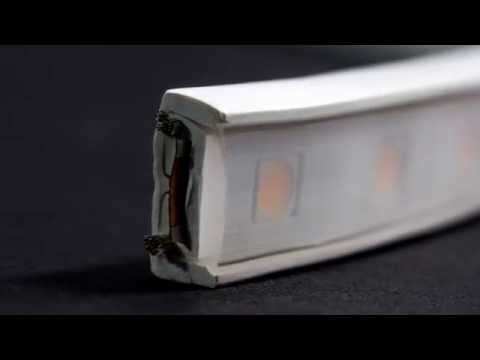 The parallel wiring to each LED ensures that if one LED goes out, the rest of the LEDs continue to operate. It is perfect for accent lighting, coves, ledges and shelves. The kit includes (1) 5-ft removable power cord with 8-Amp inverter and (1) removable end cap mounting clips. LED tape rope kit is cETLus listed.